Emerged at the end of the 35 mm Rangefinder Era as arguably the most technically advanced rangefinder of its time. 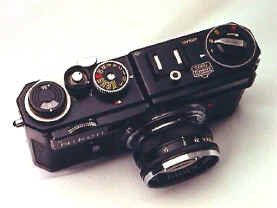 It competed directly with the other great rangefinder systems: the Leica M3, the Zeiss Contax IIA, and the Canon 7sZ. 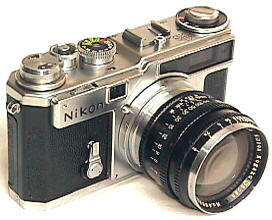 1) The Nikon SP was the first 35mm Rangefinder with SIX built in framelines. The combined RF/VF window had projected parallax frames for the 50/85/105/135. To the left of the main window was the wide angle window, showing non parallax corrected views of the 28 and 35. Keep in mind this was in 1957! It took Leica 23 YEARS to equal this feat with the M4P in 1980. The SP has a unique look due to its very large RF/VF window. It stretches across half the camera's face. SP's are instantly recognizable if you know what to look for. While legions gloat about the Leica M's great RF/VF, many don't realize that the SP's viewfinder is in some ways superior. The 35mm and 28mm frames are largely useless in the M2/4/5/6 for glasses wearers. In contrast, the SP's 35mm and 28mm frames are easily seen wearing glasses. The photog selects the 50, 85, 105 or 135 frameline by rotating the frameline dial which rotating around the rewind crank. Each frameline is color coded (unlike Leica), and each succeeding frameline coexists with larger framelines, creating kind of a tunnel effect which can quickly be followed. For example, if you are using the 50 frame, only the 50 frame will be visible. Switch to the 85, and it appears in addition to the 50..and so on. The selected frame is thus always the smallest frameline visible. While the framelines in the Leica M2 have an elegant simple three position finder with no frame overlap, the later M4-P and M6 finders are relatively cluttered and confusing with two noticeably different framelines being visible at all times (28/90, 35/135, 50/75). The SP's finder system is more pleasing and less confusing--at least to me. The SP's weak point, and the Leica M's glory, is finder & RF brightness. The overall 50-135 finder is noticeably dimmer than the Leica M's (not true of the SP's wide angle finder). In addition, the SP's Rangefinder image is a simple overlapping spot type, as compared to the Leica's much brighter rangefinder. See Rangefinder/Viewfinder profile for more details. 2) The Nikon SP was the first Japanese camera to have a single, non-rotating shutter speed dial. This doesn't seem like such a bid deal today, but it was for its time. 3) The Nikon SP had the first reliable professional quality motordrive. This was a really big deal at the time, and one of the milestones of 35mm Photography. Yes, the Praktina offered a motor before the SP, but it was notoriously unreliable and not of professional quality. Every time we shoot modern cameras and hear that little whrrrrrr of the motor, we are paying homage to the Nikon SP! 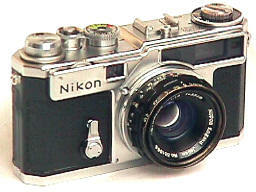 5) The Nikon SP was the first 35mm camera with Titanium shutter curtains over the last half of its production). Though untried at the time, Titanium curtains proved themselves incredibly tough and durable. A Titanium shutter SP has never had its curtain crack and peel --- like the cloth curtains on all Leica M's eventually will from old age. Likewise, the sun has never burned a hole in the SP's Titanium shutter when the camera left sitting in the sun. (A lens focused at infinity acts like magnifying glass, and will burn a hole right through a Leica RF shutter if left in the same position long enough towards the sun.) All things considered, it's strange that Leica has never incorporated this obvious improvement. 6) During its production, SP boasted the longest lens range of any 35mm Rangefinder System, from 21/4 to a 1000/6.3! Currently Leica has given up on the marketability of its reflex housing Viso system for long lenses, offering only a range from 21 to 135 for the M6. After the SP was discontinued, the Canon 7sZ's lens lineup was 19 mm to 1000 mm. 7) Nikon was the first (and for many years the only) rangefinder system to offer a Macro lens in the 50/3.5 Micro-Nikkor. Other interesting and now rare lenses included the 21/4, the 25/4, the 50/1.1, the 85/1.5, the 85/2 Black, the 105/2.5, the "mountain" 105/4, the 180/2.5 for reflex housing, and the huge 500/5 and 1000/6.3. The earlier Nikon RF lenses were all chrome. 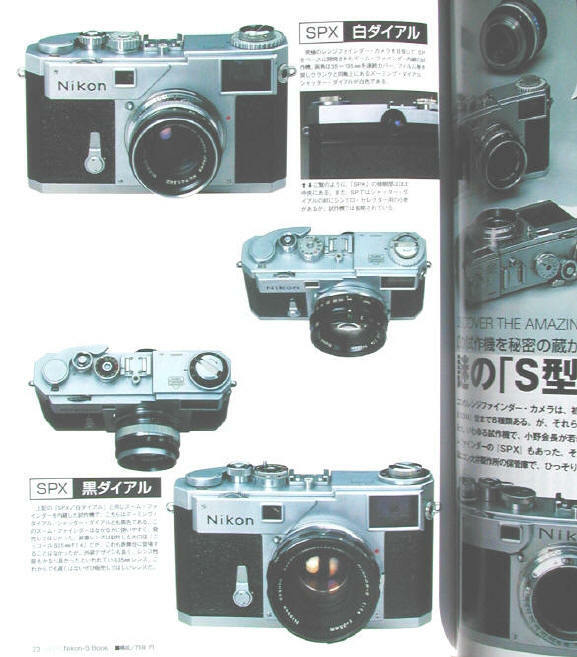 They match up with the earlier Nikon I/M/S/S2 models. Towards the end of the S2 production, Nikon started switching to lighter weight black lenses. Some lenses were made in both chrome and black, a few were made in black only. Except for the earliest lenses, chrome lenses generally sell for slightly less than black lenses, everything else being equal. The SP has a very nice feel to it, every bit competitive to the M3. The Leica has a brighter RF/VF, but the SP is easier and faster to load and rewind. The SP's finish was beautiful. It's a pity that few mint cameras remain. If you see a tired worn SP sitting on a shelf, realize its only a shadow of its once beautiful self. As great as the SP's finish was, Leica and Contax edged it out finish wise, but the SP edged out the Canons. 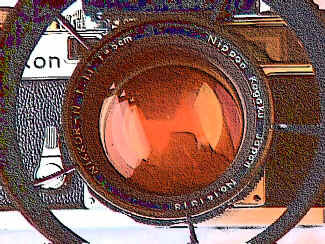 The focusing wheel just behind "Nikon" focuses the 50/2, 50/1.4, 25/4, 28/3.5, 35/3.5 and 35/2.8. The other lenses are focused by turning their lens barrels. The little metal tab just in back of the focusing wheel is the infinity lock for those lenses. Push it and it unlocks. 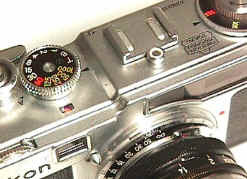 The shutter speed dial is a single non-rotating dial, just like on the later F's. Pull up and rotate the shutter speed dial to set the sync for electronic flash or flash bulbs. You use the color codes in the little window in front of the dial. In the pic it's set to the red dot, a flash bulb setting. For flash, set it to "FX" and use a shutter speed of 1/60th or slower. Notice the "A" and the "R" in front of the shutter release. By turning the shutter release collar, you set the camera to advance or rewind the film. The film counter is automatic, but you do manually set the reminder for 20 or 36 exposures. Shown mounted is the hard to find and sharp black 85/2 Nikkor. Time has proven the SP shutter more reliable than the Leica or Contax. Nine out of ten Leica rangefinders (M's or screw mounts) rescued from retirement closets after 30 years need shutter work. Inaccurate or inoperative slow speeds are VERY common with ANY Leica rangefinder sitting for years without regular shutter exercise. If sitting for decades in their retirement closet, about 10% need their cloth shutter curtains replaced too. In contrast, Nikon SP's stored under the identical conditions usually have no need of shutter repairs or adjustments. I have never had to replace a Titanium Nikon shutter curtain. Bob Rotoloni, in his superb book Nikon Rangefinder Camera, states that 22,348 SP's were produced from 1957 to 1962. To put this in perspective, about 165,000 total Nikon Rangefinders were made, about 950,000 Nikon F's were made, and about 225,000 Leica M3's were made. The SP is a relatively rare camera, sought by users and collectors alike. The rarest SP are the black ones, originally sold just to photojournalists. Occasionally you will see SP's with serial numbers ranging in the 30,000 range or over. These are cameras with replacement top plates. About the first SP's 14,000 had cloth shutters. The remaining production used titanium shutter curtains of the just introduced Nikon F. Today the Titanium shutter SP's sell for more than the cloth curtains. The cloth shutters are a bit quieter to my ears, but the Titanium is undeniably more durable. The SP's larger shutter speed dial is easier to change than the smaller dial on the Leica M's. 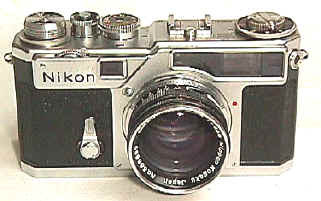 The later titanium shutter SP's share some parts with the Nikon F, namely the lever advance, the self timer, and the film counter cover. The interesting part of this is that these shared parts ARE NOT the first series of F parts. Try to figure that one out! The Nikon SP is superior to the Leica M's when it comes to using sync cords. SP's use a standard PC terminal, placed out of the way on the camera's front left edge. Here it won't easily end up in the photogs eye, like the Leica M design. M3's & M2's used a non standard sync outlet which was a bit of a pain. Later Leica went with the standard sync outlet, but in the same location which is easily in your way. Nikon optics of the era had a much harder front coating than Leitz. You will very seldom find cleaning marks on Nikon Rangefinder Lenses. In contrast, cleaning marks are very common on Leitz lenses of the same era. Likewise, Nikkor lenses are usually clear as bell after decades of storage. Leitz lenses of the 50's and 60's are often very foggy after years of storage due to the condensation of the lubricant they used. According to Don Chatterton, this is due to the sperm whale oil lubricant Leitz used at the time. 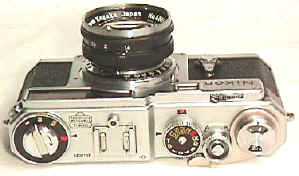 The SP, as well as all Nikon Rangefinders, used a modified Zeiss Contax Rangefinder mount. Nikon tried to copy it exactly, but failed in that the Nikon helical thread is a slightly different pitch than Contax. It was 1946, and the B-29's had left few precision measuring instruments in their wake. While wide angle lenses can be interchanged between the two systems, the difference in focusing starts to show up in the 85's and longer. Some authors claim that the Contax mount is inherently weaker and more trouble prone than Leica's. I don't agree. While the helical built in the body does require a lube from time to time, so does the helical for Leica's lenses. I consider it a draw on this point since both require occasional maintenance. The Nikon/Contax RF mount is peculiar in having the focusing helical for 50 mm lenses built into the camera body and focused with a rotating wheel which falls neatly beneath the right index finger. All other lenses except for the 25 are designed to be focused using their own helical. The focus wheel for the 50 takes a bit of getting used to, but is not inconvenient. The focus wheel can be dispensed with by turning the 50's own barrel if you like. Mount wide angle and telephoto lenses by turning the focusing mount AND the lenses back to infinity. You might be surprised if you ever compare a 50/1.4 Nikkor mounted on a SP, side by side to a 50/1.4 Summilux on a M6. The Leica lens is about 3 times larger! The SP wins the light compact 50/1.4 race. While some will argue superiority between the Leitz/Nikon/Contax/Canon lenses of this era, my experience found very little difference between them using medium or fast films in hand held shooting. They will all give great professional results--just as you would expect of professional quality cameras. The SP was not Nikon's final Rangefinder. 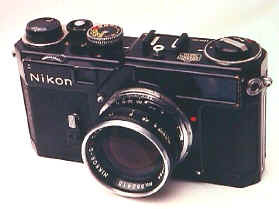 Nikon went on in 1959 to develop the SPX. It was a rangefinder based on the F body, with a 35-135 zoom finder, and TTL Metering! All this was years before the Leica M5's TTL metering. Tragically for rangefinder lovers, the SPX never made it to production due to the dwindling rangefinder market and the Nikon F's unparalleled runaway sales. The SPX is also called the SP II in some Japanese text. These pics are from Shibata's great Nikon Rangefinder book, of which I still have a few left. The lower pic shows a prototype 35/1.4 mounted on the SPX! Years ago I was told of the SPX by a Los Angeles camera dealer. He claimed to have sold one in the 70's at a camera show, to a Japanese tourist who had an amazed look on his face. At first it was hard to believe at the time since no one, not even Rotoloni, could confirm it. Finally I got confirmation in a letter by Herbert Keppler, long time publisher of Modern Photography, who remembered seeing the SPX prototype. When the Nikon Historical Society met in Tokyo they saw at the Nikon Museum, proving the SPX existence to American collectors once and for all. Though not practical from a marketing standpoint, the SPX showed Nikon's superior design and leading technology in the last stages of the Rangefinder Era. The Nikon SP System is truly an outstanding camera design and 35mm Photography milestone. I always smile knowing that my 1957 SP is in some ways still superior to Leica's latest rangefinder film effort. 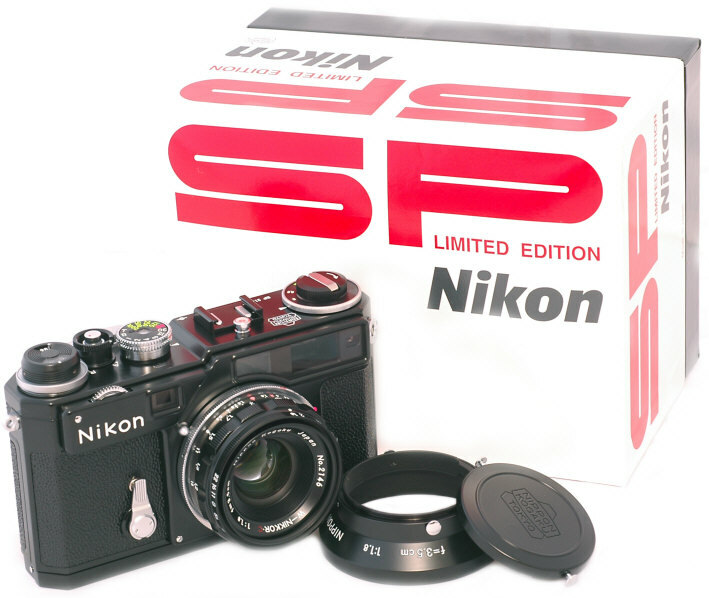 For at least the last 35 years, the Nikon SP has been one of the most sought after 35mm collectibles. SP's continue to get harder to find. Prices just keep on going up--and show no signs of letting up. Not bad, for just a camera. NEW Nikon Black SP! To most dedicated Nikon collectors, there is no Nikon quite as desirable as the black Nikon SP. Revised: September 12, 2017 . Copyright � 1998-2002 Stephen Gandy. All rights reserved. This means you may NOT copy and re-use the text or the pictures in ANY other internet or printed publication of ANY kind. Information in this document is subject to change without notice. Other products and companies referred to herein are trademarks or registered trademarks of their respective companies or mark holders.